I'm wary about investing in all three of these companies, but I'd only consider changing my tune on one of them. Successful investing is all about separating companies that you want to own from those that you don't. For that reason, I find it helpful to keep a running list of stocks that I'd never want to own. That way I won't ever be tempted to buy them when they inevitably go "on sale." With that in mind, here are two companies that I've permanently added to my "never buy" list, and one more that I would only consider owning under special circumstances. I'm a casual gamer, so a handful of Zynga's (NASDAQ:ZNGA) hits like FarmVille and Words With Friends have found their way onto my phone. These games can be a lot of fun to play and they're free, so why not give them a try? However, while I greatly enjoy playing the company's games, I can't ever see myself warming up to Zynga's stock. Why? Simply put, the company is dependent on creating hit game after hit game to drive its revenue higher, which is a business model I don't like. Sure, sales can surge in the short term when a game goes viral, but things can turn ugly once consumers move on. ZNGA Revenue (TTM) data by YCharts. 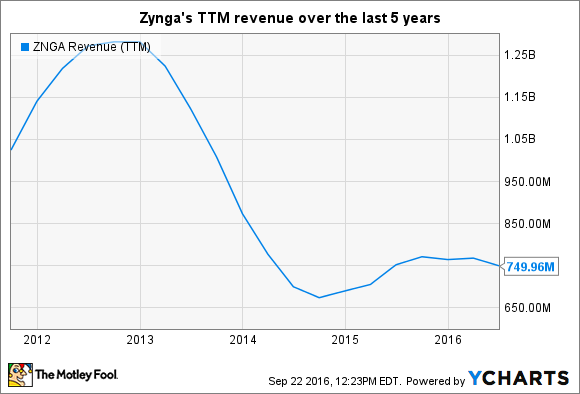 I have no ability to predict whether Zynga's next game will be a home run or a strikeout, so it is hard to see how the company can sustainably grow its revenue and profits over time. That's why I can't ever see myself becoming a shareholder. Rewind the clock a few years to when Abercrombie & Fitch's (NYSE:ANF) brand was all the rage: Consumers were happy to pay through the nose to get their hands on the company's swag, which caused revenue and profits to soar. Unfortunately, one huge problem with retail focused on teenagers is that it is nearly impossible to keep a brand in fashion for long periods of time. And when a retailer's brand finally loses its luster, bad things can happen. ANF Revenue (TTM) data by YCharts. It is as clear as day that each one of these metrics is heading in the wrong direction, and I have a hard time seeing how the company can pull out of this tailspin. Sure, Abercrombie could become cool again, but recent results suggest that's not happening. Last quarter comparable sales declined by 4%, and management even stated that it is struggling to drive traffic at its flagship stores. That's not a good sign. 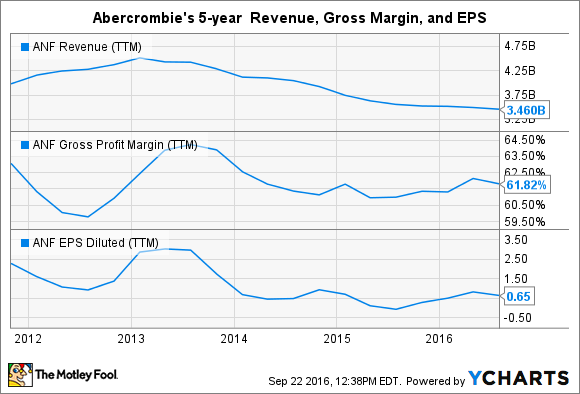 Abercrombie's stock has become a turnaround story, and I'm a fervent believer that turnarounds rarely work out. That makes this a stock I plan on avoiding. My conservative investing style keeps me away from the majority of stocks in the biotechnology sector, but one company I might consider changing my tune on is Sarepta Therapeutics (NASDAQ:SRPT). The company's stock has been on a tear ever since the FDA approved the sale of its Duchenne muscular dystrophy (DMD) drug Exondys 51. More recently we learned that the company will charge $300,000 for an annual dose of the drug, so it's not hard to imagine that this company could soon be rolling in dough. However, the FDA's approval did come with the stipulation that Sarepta must provide additional clinical data to prove that Exondys 51 is an effective treatment. If the company fails to do so, then the FDA could reverse its decision and pull the drug from the market. That would leave Sarepta in a tough spot. While I'm hopeful that Exondys 51 will be a massive hit and provide real clinical benefits to patients, the investor in me knows that the drug's phase 2 data were far from perfect. That makes it hard to handicap the drug's long-term chances of success, which makes Sarepta far too risky for my taste. Therefore, I can't call shares a buy until we have that long-term clinical data in hand. Until then, I think that staying on the sidelines is the smart play.